SCOPE Miami Beach returns to Ocean Drive for its 17th installment. The art fair will begin with a VIP Preview on December 5th and run through December 10th. This year SCOPE will feature 140 exhibitors from 25 countries and 60 cities, one of whom will be notorious street artists WhIsBe. He plans to bring several of his 7-foot Gummy Bear sculptures to the fair. “I’d like to have those there because I see the impact that they have as public art installations.” This year fair sponsors include artnet, the Museum of Contemporary Art North Miami and the Perez Art Museum Miami. 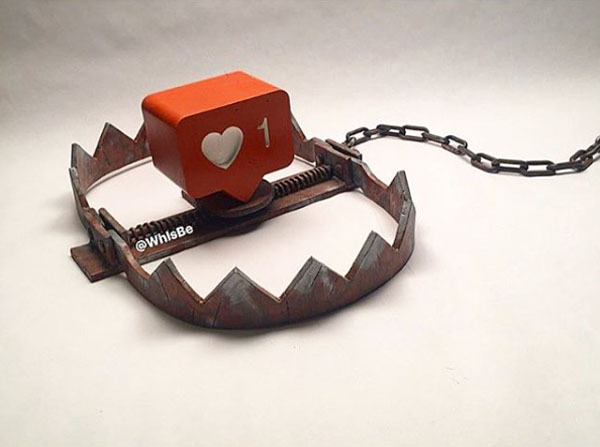 This year at SCOPE WhIsBe will be exhibiting some new works as well including his Social Networking sculpture continuing his theme of cultural examination and socio-awareness. He was first internationally recognized for his McDictator work, which was a mash up of Ronald McDonald and Adolf Hitler. 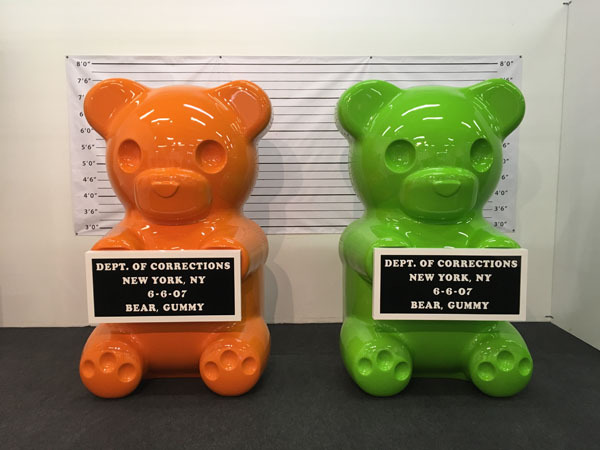 The “Vandal Gummy,” a 7-foot tall Gummy Bear holding a Department of Corrections placard that was recently installed in the lobby of 4 World Trade Center has become an instant hit with locals and tourists alike. “It’s insanely popular. It’s so wild,” says the artist, who is known as WhIsBe – for “What Is Beauty?” “I would have never thought I’d have a sculpture in the lobby of the World Trade Center if you had asked me a few years ago,” he adds. Since the installation, he’s been written up in Forbes, WWD and Business Insider, and was the subject of a video by Vice News. The notoriety came about after developer Larry Silverstein invited a group of street artists to work on a mural project on the vacant 69th floor of 4 WTC. “It’s like, I did a mural project on the 69th floor, it’s super dope, I got to paint with my homies and had a great time,” WhIsBe says. Silverstein’s idea proved successful; in addition to giving young artists coveted space, the mural helped sell the property. Spotify, the music streaming service, rented the space after seeing the art installation. Negotiations for the lobby sculpture followed – WhIsBe acted as his own agent, and the process taught him a lot about public installations and corporate politics. “All of that transpired through the mural project on the 69th floor, through working with Silverstein Properties, and Silverstein himself,” says the 29-year-old. He is the only artist from the original mural group to have an additional piece in the building. “The opportunity at the World Trade Center, and what’s come from that just spiked my career in terms of momentum.” A New York native, WhIsBe notes that just having the opportunity to paint in the World Trade Center is incredible. WhIsBe grew up painting, studied at the School of Visual arts, and after a hiatus, turned to street art five years ago. He has now exhibited at art fairs including Art Basel, Art New York, and Art Southampton, had an installation at the New Museum, and his work is now in the collection of MOCO Museum Amsterdam.